When was the last time you were alone? As in, alone alone. Not just by yourself in the house when one kid was napping and the other was at school. Or the times your husband has watched the kids so you could run to Target solo (wah hoo!). I'm talking about the last time you had zero kid responsibilities for more than one or two hours. Can't remember the last time? You're not alone. So many mothers-- including me-- rarely have the chance to be alone for a significant portion of time. Yes, a few moms may go on an annual girls weekend or an anniversary getaway, and that is wonderful, but I venture to guess that for many of us, such trips are rare for various reasons-- lack of funds, too much guilt or anxiety, the absence of trustworthy childcare, overwhelming work. The list goes on. While I wasn't able to take an entire weekend off from reality, I recently made the radical decision to GO TO A MOVIE. No Redbox. No Netflix. I wanted to go to an actual theater during the day (full disclosure: going at night when the kids are asleep would defeat the purpose). I have only been to a movie once since my son was born [4.5 years ago!]. Other than that, it has been a good 5 years. This isn't to say I don't get out. I do. Date nights are a priority, with permanent marker on the calendar, and we have a great time together. But because we don't have tons of dates, we don't use precious babysitter time to silently sit in a movie theater. We would rather go out to eat, talk, laugh, and enjoy each other's company. Most of my alone time without my husband involves writing, which I love, but it still makes my brain work. A movie sounded like a true mini-escape. My decision was made. I checked online for the movie I wanted to see, and I put it on the calendar. Meaning This Is Happening. I told my husband to put it on his calendar too, and he was happy to. I'm fortunate that he is so supportive. I realize not everyone may have that. Now get this: I asked seven mom friends to join me. All of whom I know could use a break. Guess how many said yes? ZERO. Every single one had something else on their calendar that day. (Before you go thinking I must be the local pariah, I swear I'm not. At least, I don't think I am...). In fact, I think their unavailability speaks to the issue at heart here-- how full all of our days are as mothers of young children. Rather than slink into my shell, cancel my plans, and boo hoo that no one wanted to join me, I figured, well, it's on the calendar. I'm going! I was excited all week for my little escape. This enthusiasm helped me get through the week in a more positive way too; I expended more energy with my kids (and enjoyed it more) knowing that I would have a significant break. I was surprised at how many people were in the lobby, just milling around like it was nothing special, when to me, it felt momentous! Who are these people? Who does this regularly? I kept thinking. Boy have things changed. First, let me warn you: there is no matinee price anymore. It cost $8.50 for a single ticket at 1:50 in the afternoon! Still, I reasoned, it's less than I would spend wandering shops or even taking the kids to McDonald's. So, um, a real steal in that way, right? Guess what else-- the huge packages of candy aren't behind a glass case anymore. You pick it and bring it up to the counter! It gets even better: They have TEA now! I decided why not? and grabbed an overpriced bag of Reeses Pieces and ordered a Tazo tea. I found the right room, slunk into a hermit-ish high-up aisle seat, and I was in heaven. The movie was beyond fantastic (Gone Girl, in case anyone is wondering) and I enjoyed every. single. second. of the movie itself and of the experience just sitting somewhere, resting. With no chores to do during commercial breaks, and no kids walking in the door any second demanding to be fed. When the show was over, I felt excited to go home and rejoin family life. I felt refreshed instead of drained. I give it-- all of it-- Two Thumbs Up. When was the last time you took more than an hour for yourself to do something totally un-kid and un-work related? Ever? Or do you manage it regularly? Final Note: If you never do anything for yourself, and you are able to swing it, I hope this post encourages you to do so. You deserve it. 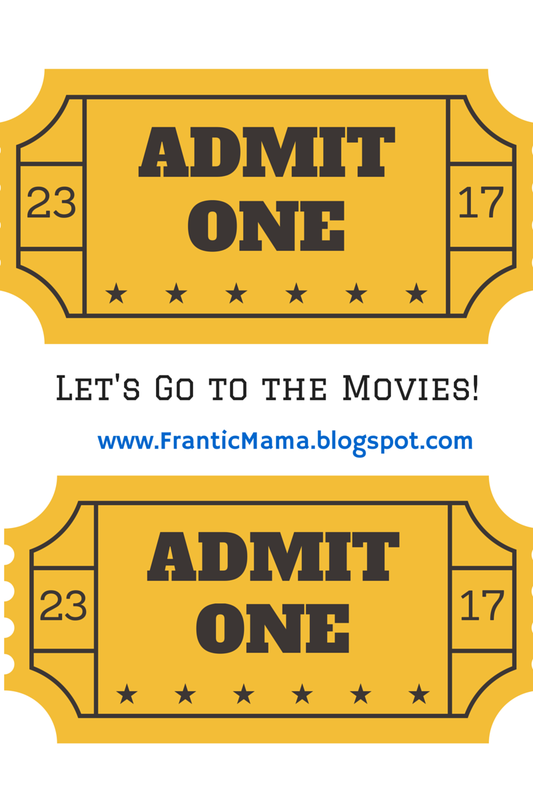 *Want to read more about Frantic Mama's views on Mommy Guilt and Alone Time? Here are 3 related posts: The Pull of Motherhood, 10 Ridiculous Ways Moms Spend Alone Time, and Interesting Phenomenon: I Miss My Kids. Connect with Frantic Mama on Facebook and Twitter! Clash of the Couples, a hilarious anthology I contributed to, is now available! Find it at a bookstore [i.e. Amazon] near you.